In Siena’s rivalry with Florence, the Sienese painters, like Beccafumi embraced a mystic presence, where the Florentines leaned towards naturalism. Beccafumi was considered one of the last painters to fully embrace the Sienese School. Born Giacomo di Pace, he took the surname of his father’s estate owner and later patron, Lorenzo Beccafumi. After an apprenticeship that Lorenzo connected the young Giacomo to, he went on to explore the art of Michelangelo (1475 – 1564) and Raphael (1483 – 1520) in Rome. 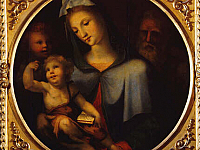 Beccafumi also traveled through Florence where he was exposed to Leonardo da Vinci’s (1452 – 1519) skillful use of Chiaroscuro (contrast through Light and Dark). From this influence of the Italian masters, Beccafumi infused his elegant and emotional Sienese style with that of Mannerism’s abstractions of the period. Of his early works in Siena, he painted with his contemporary Il Sodoma (1477 – 1549) on the façade of the Palazzo Borghese in 1512. After this in 1517 he led the painting of the church of San Bernardino and created several religious works at these and other of Siena’s churches. Of these works are pieces such as, The Miraculous Communion of Saint Catherine of Siena and Saint Catherine Receiving the Stigmata, now both in the J. Paul Getty Museum in Los Angeles. Beccafumi’s drawing, Study for the Figure of Abraham, from 1547 is also at the Getty Museum. Of his works at the Uffizi Gallery are Holy Family with the young Saint John from 1518 or 1520 and Escape of Clelia and the Roman Virgins. Perhaps better known is the work he did for the decorative pavement at the Duomo di Siena (Cathedral of Siena). This tremendous undertaking took artists over a century and a half to complete, of which Beccafumi worked on from 1517 – 1544. His white marble engravings depict stories from the bible, including Ahab, Elijah, Melchisedec, Abraham, and Moses. He was then commissioned by Prince Doria in Genoa to paint a fresco of an Episode in the Life of Medea and Jason, which is now lost. He returned to Siena shortly after to complete more work for the Cathedral of Siena. He also created a triumphal arch for the entry into Siena of Emperor Charles V (1500 – 1558), along with a mechanical horse for the festivities. Beccafumi’s work has been described as have elongated forms, like those of Mannerist painters, as well as employing Contrapposto (a relaxed pose) revived by Michelangelo and da Vinci in the Renaissance. He used soft colors, sometimes said to be primal in tone, and a fluid composition distinct from the hard, geometrical edges often used by painters of the time. This is highly evident in his piece, Holy Family with the young Saint John, at the Uffizi. Beccafumi’s work could take on an almost jarring, emotional feel in its composition that conjured mystical rapture; a drastic culmination of the Sienese style.